The New Jersey rental agreements are written for the use of an owner of residential or commercial property to allow the usage of space in trade for monthly payment. All documents must be created in accordance with Title 46 (2013 Revised Statutes “PROPERTY”) and upon the authorization of all parties the form becomes legally binding until the end of its term. Rental Application – Used as a tool for the landlord to check the identity and employment status of the tenant before signing a contract. Association of Realtors – Provided by the Association of New Jersey Realtors for a fixed term arrangement. Commercial Lease Agreement – For the use of a business primarily for industrial, office, or retail space. Lease with Option to Purchase Agreement – Form that gives the lessee the right to buy the premises for an agreed upon amount. Month to Month Lease Agreement (§ 2A:18-56)- Known as a tenancy at will that can be terminated at any time with a notice to quit with one (1) month’s notice. Room Rental (Roommate) Agreement – To establish the terms of a living situation between the members of a housing arrangement where the activities of cleaning and paying bills are shared. Standard Residential Lease Agreement – Generic contract for a fixed term. Usually one (1) year. Sublease Agreement – The tenant of a residential dwelling that decides to rent their space to someone else. In most cases the subtenancy is conditional upon the landlord’s approval. 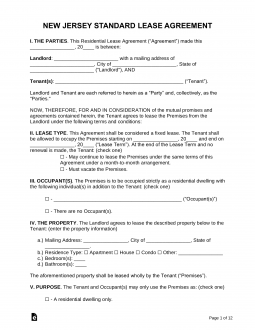 Termination Lease Letter (30-Day Notice) – Allows a tenant or landlord to cancel a month to month agreement with at least one (1) month’s notice according to § 2A:18-56. Flood Zone (§ 46:8-50) – If the landlord’s property is located in a flood zone it must be stated to the tenant. A owner may find out if the premises is located in such zone by using the Flood Zone Lookup Tool provided by FEMA. This applies to landlords of residential and commercial property other than dwelling units in a premises containing not more than two such units, or in an owner-occupied premises of not more than three dwelling units. Lead-Based Paint – Federal law that makes all property owners of units built before 1978 to inform their tenants of the presence of this type of dangerous paint. Truth in Renting Act (§ 46:8-45) – The landlord must provide this statement to all tenants except for those in residential dwellings of two (2) or less units and three (3) or less units if the lessor occupies a unit within 30 days of lease signing. The owner (landlord) is required by law to provide, install and maintain window guards in the apartment if a child or children 10 years of age or younger is, or will be, living in the apartment or is, or will be, regularly present there for a substantial period of time if the tenant gives the owner (landlord) a written request that the window guards be installed. The owner (landlord) is also required, upon the written request of the tenant, to provide, install and maintain window guards in the hallways to which persons in the tenant’s unit have access without having to go out of the building. If the building is a condominium, cooperative or mutual housing building, the owner (landlord) of the apartment is responsible for installing and maintaining window guards in the apartment and the association is responsible for installing and maintaining window guards in hallway windows. Window guards are only required to be provided in first floor windows where the window sill is more than six feet above grade or there are other hazardous conditions that make installation of window guards necessary to protect the safety of children. According to § 5:10-5.1 the landlord must provide at least one (1) day’s notice to the tenant before entering their property. Maximum (§ 46:8-21.2) – Landlord may not charge more than one and a half (1.5) months’ rent for the initial deposit. If the tenant remains on the property for more than one (1) year the landlord may not request more than an additional ten percent (10%) of the monthly amount. Returning (§ 46:8-21.1) – Landlord must return any and all funds related to the deposit within thirty (30) days of the termination date. Tenants’ Rights Handbook – Provided by the Legal Services of New Jersey to help tenants be informed about their rights. Truth in Lending Act Guide – Provided by the New Jersey Department for Consumer Affairs to inform landlord and tenants about their rights. Must be attached to the lease. Habitability Bulletin – Provides the responsibilities of landlords and tenants for maintaining rental units.